Michael T. “Nuf Ced” McGreevy (1865-1943), owner of “McGreevy’s 3rd Base Saloon” in Roxbury, MA, established himself as one baseball’s most well-known fans. McGreevy is credited with pioneering many aspects of baseball fan culture, including the introduction of popular music into major league ballparks. He was also one of the earliest and most prolific collectors of baseball memorabilia and he proudly displayed his collection in his saloon, which became a favorite of fans and players alike. 1920- Michael T. McGreevy is forced to close down his famous saloon and baseball emporium with the onset of Prohibition under the Volstead Act. 1920- McGreevy leases his former saloon building to the City of Boston for a new “Roxbury Crossing” branch of the Boston Public Library. Belden described the McGreevy’s assemblage “showing the evolution of our great national game” as an important addition to the library collections. Thus, the “M. T. McGreevey Collection of Baseball Pictures” was formally instituted . Sometime between 1978 and 1981, close to twenty-five percent of the entire “McGreevey Collection of Baseball Pictures” walked out of the Boston Public Library’s doors onto Copley Plaza. Someone was able to walk off with close to 56 of “Nuf Ced” McGreevy’s treasured baseball photographs, some of which were as large as two-feet long. Originally donated for the benefit of the citizens of Boston, the collection was compromised and almost three decades later, the mystery of the thefts remains unsolved. In fact, even more mystery and speculation has developed with the revelations that many of the gems from McGreevy’s Collection made their way into the famous collection of ex-New York Yankee owner Barry Halper. 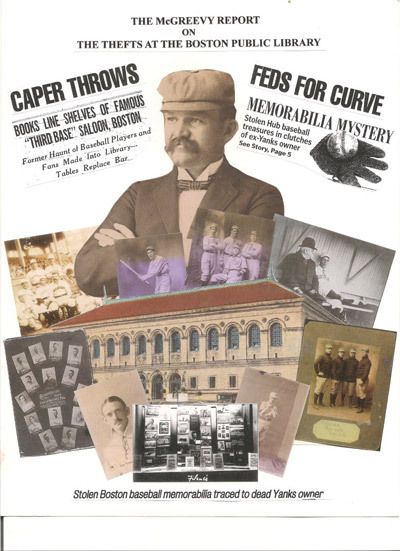 McGreevy’s pictures, which once adorned the walls of his famous “3rd Base Saloon,” somehow traveled to Copley Plaza and were then pathetically disbursed to the selling tables of baseball card dealers, the basements of unscrupulous collectors and even the auction blocks of the vaunted house of Sotheby’s. 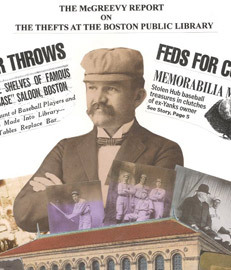 While the infamous art-heist from the Isabella Stewart Gardner Museum remains Boston’s greatest crime mystery, the theft of the McGreevy Collection from the Boston Public Library is perhaps its only rival in terms of the magnitude of the theft and its unsolved status. While not valued in the hundreds of millions, the baseball collection of McGreevy represents an important piece of Boston’s cultural and sporting heritage. McGreevy’s stolen items might now be valued in the hundreds of thousands, but their value to the citizens “Nuf Ced” McGreevy intended to enrich is priceless. Unlike the Gardner heist, however, the Boston Public Library has experienced the recovery of at least twenty of McGreevy’s rare and important pictures. Thirty years after the heist, there are still 36 stolen baseball scenes missing, and the identity of the thief still remains a mystery.